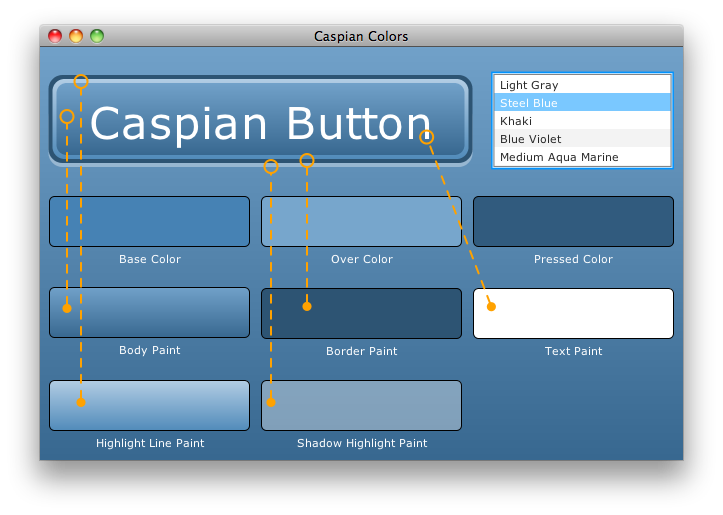 Dean Iverson has just now blogged about creating custom Caspian controls in JavaFX. As soon as I saw his link run up on Twitter I fired it around my team mates in the JavaFX controls team (yes, we’re still working, and in fact we’re all working precisely on what Dean is talking about). We all like what he is doing, and with JavaFX 1.3 coming up we hope to make this kind of thing far easier. Creating custom controls in JavaFX is not difficult. Creating custom controls that fit nicely with the default Caspian theme, with its pervasive use of gradients and animation, is a little trickier. This is only because the utility classes and methods that make it simple lie buried within com.sun packages that are not publicly documented. A little digging reveals a few gems that can be used to make your controls fit right in with the core JavaFX controls. So, if you’re keen right now to create great looking skins in JavaFX using the Caspian technology that shipped in JavaFX 1.2, give Deans blog post a read.